Virtually all steel is now made in integrated steel plants using a version of the basic oxygen process or in specialty steel plants (mini-mills) using an electric arc furnace process. The open hearth furnace process is no longer used. In the basic oxygen process, hot liquid blast furnace metal, scrap, and fluxes, which consist of lime (CaO) and dolomitic lime (CaO.MgO or "dolime"), are charged to a converter (furnace). A lance is lowered into the converter and high-pressure oxygen is injected. The oxygen combines with and removes the impurities in the charge. These impurities consist of carbon as gaseous carbon monoxide, and silicon, manganese, phosphorus and some iron as liquid oxides, which combine with lime and dolime to form the steel slag. At the end of the refining operation, the liquid steel is tapped (poured) into a ladle while the steel slag is retained in the vessel and subsequently tapped into a separate slag pot. There are many grades of steel that can be produced, and the properties of the steel slag can change significantly with each grade. Grades of steel can be classified as high, medium, and low, depending on the carbon content of the steel. High-grade steels have high carbon content. To reduce the amount of carbon in the steel, greater oxygen levels are required in the steel-making process. This also requires the addition of increased levels of lime and dolime (flux) for the removal of impurities from the steel and increased slag formation. There are several different types of steel slag produced during the steel-making process. These different types are referred to as furnace or tap slag, raker slag, synthetic or ladle slags, and pit or cleanout slag. Figure 1 presents a diagram of the general flow and production of different slags in a modern steel plant. The steel slag produced during the primary stage of steel production is referred to as furnace slag or tap slag. This is the major source of steel slag aggregate. After being tapped from the furnace, the molten steel is transferred in a ladle for further refining to remove additional impurities still contained within the steel. This operation is called ladle refining because it is completed within the transfer ladle. During ladle refining, additional steel slags are generated by again adding fluxes to the ladle to melt. These slags are combined with any carryover of furnace slag and assist in absorbing deoxidation products (inclusions), heat insulation, and protection of ladle refractories. The steel slags produced at this stage of steel making are generally referred to as raker and ladle slags. Figure 1. Overview of slag production in modern integrated steel plant. Pit slag and clean out slag are other types of slag commonly found in steel-making operations. They usually consist of the steel slag that falls on the floor of the plant at various stages of operation, or slag that is removed from the ladle after tapping. Because the ladle refining stage usually involves comparatively high flux additions, the properties of these synthetic slags are quite different from those of the furnace slag and are generally unsuitable for processing as steel slag aggregates. These different slags must be segregated from furnace slag to avoid contamination of the slag aggregate produced. In addition to slag recovery, the liquid furnace slag and ladle slags are generally processed to recover the ferrous metals. This metals recovery operation (using magnetic separator on conveyor and/or crane electromagnet) is important to the steelmaker as the metals can then be reused within the steel plant as blast furnace feed material for the production of iron. While most of the furnace slag is recycled for use as an aggregate, excess steel slag from other operations (raker, ladle, clean out, or pit slag) is usually sent to landfills for disposal. Steel slag can normally be obtained from slag processors who collect the slag from steel-making facilities. Slag processors may handle a variety of materials such as steel slag, ladle slag, pit slag, and used refractory material to recover steel metallics. 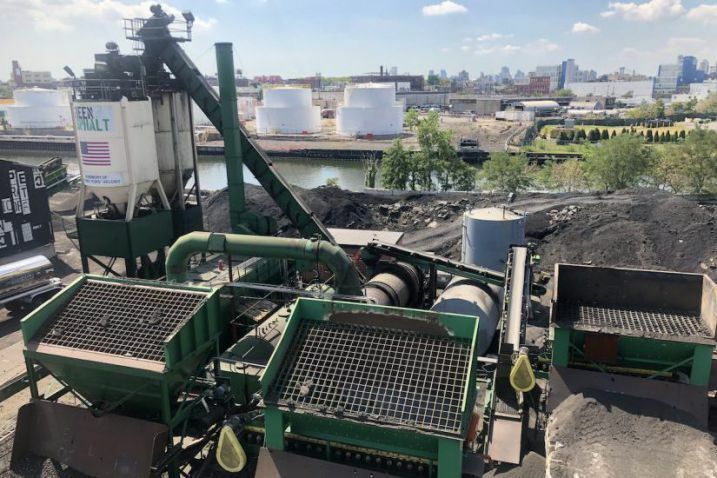 These materials must be source separated, and well-defined handling practices must be in place to avoid contamination of the steel slag aggregate. The slag processor must also be aware of the general aggregate requirements of the end user. The processing of steel slags for metals recovery is not only important to remove excess steel at the market source for reuse at the steel plant, but is also important to facilitate the use of the nonmetallic steel slag as construction aggregate. This nonmetallic slag material can either be crushed and screened for aggregate use (steel slag aggregates), or sintered and recycled as flux material in the iron and steel furnaces. Steel slag aggregates generally exhibit a propensity to expand. This is because of the presence of free lime and magnesium oxides that have not reacted with the silicate structures and that can hydrate and expand in humid environments. This potentially expansive nature (volume changes of up to 10 percent or more attributable to the hydration of calcium and magnesium oxides) could cause difficulties with products containing steel slag, and is one reason why steel slag aggregates are not suitable for use in Portland cement concrete or as compacted fill beneath concrete slabs. Steel slag destined for use as an aggregate should be stockpiled outdoors for several months to expose the material to moisture from natural precipitation and/or application of water by spraying. The purpose of such storage (aging) is to allow potentially destructive hydration and its associated expansion to take place prior to use of the material in aggregate applications. There is a wide variation in the amount of time required for adequate exposure to the elements. Up to 18 months may be needed to hydrate the expansive oxides. Prior to its use as a construction aggregate material, steel slag must be crushed and screened to meet the specified gradation requirements for the particular application. The slag processor may also be required to satisfy moisture content criteria (e.g., limit the amount of moisture in the steel slag aggregate prior to shipment to a hot mix asphalt plant) and to adopt material handling (processing and stockpiling) practices similar to those used in the conventional aggregates industry to avoid potential segregation. In addition, as previously noted, expansion due to hydration reactions should be addressed prior to use. Steel slag aggregates are highly angular in shape and have rough surface texture. They have high bulk specific gravity and moderate water absorption (less than 3 percent). Table 1 lists some typical physical properties of steel slag. Table 1. Typical physical properties of steel slag. The chemical composition of slag is usually expressed in terms of simple oxides calculated from elemental analysis determined by x-ray fluorescence. Table 2 lists the range of compounds present in steel slag from a typical base oxygen furnace. Virtually all steel slags fall within these chemical ranges but not all steel slags are suitable as aggregates. Of more importance is the mineralogical form of the slag, which is highly dependent on the rate of slag cooling in the steel-making process. The cooling rate of steel slag is sufficiently low so that crystalline compounds are generally formed. The predominant compounds are dicalcium silicate, tricalcium silicate, dicalcium ferrite, merwinite, calcium aluminate, calcium-magnesium iron oxide, and some free lime and free magnesia (periclase). The relative proportions of these compounds depend on the steel-making practice and the steel slag cooling rate. Free calcium and magnesium oxides are not completely consumed in the steel slag, and there is general agreement in the technical literature that the hydration of unslaked lime and magnesia in contact with moisture is largely responsible for the expansive nature of most steel slags. (1,2) The free lime hydrates rapidly and can cause large volume changes over a relatively short period of time (weeks), while magnesia hydrates much more slowly and contributes to long-term expansion that may take years to develop. Steel slag is mildly alkaline, with a solution pH generally in the range of 8 to 10. However, the pH of leachate from steel slag can exceed 11, a level that can be corrosive to aluminum or galvanized steel pipes placed in direct contact with the slag. Processed steel slag has favorable mechanical properties for aggregate use, including good abrasion resistance, good soundness characteristics, and high bearing strength. Table 3 lists some typical mechanical properties of steel slag. * Hardness of dolomite measured on same scale is 3 to 4. ** Typical CBR value for crushed limestone is 100%. Due to their high heat capacity, steel slag aggregates have been observed to retain heat considerably longer than conventional natural aggregates. The heat retention characteristics of steel slag aggregates can be advantageous in hot mix asphalt repair work in cold weather. JEGEL. Steel Slag Aggregates Use in Hot Mix Asphalt Concrete. Final Report, prepared by John Emery Geotechnical Engineering Limited for the Steelmaking Slag Technical Committee, April, 1993. Noureldin, A. S., and R. S. McDaniel. "Evaluation of Steel Slag Asphalt Surface Mixtures," Presented at Transportation Research Board 69th Annual Meeting, Washington, DC, January, 1990. Emery, J. J. "Slag Utilization in Pavement Construction," Extending Aggregate Resources. ASTM Special Technical Publication 774, American Society for Testing and Materials, Washington, DC, 1982. Gupta, J. D., and W. A. Kneller. Precipitate Potential of Highway Subbase Aggregates. Report No. FHWA/OH-94/004, Prepared for the Ohio Department of Transportation, November, 1993. Steel slag can be processed into a coarse or fine aggregate material for use in dense- and open-graded hot mix asphalt concrete pavements,(1,2,3)and in cold mix or surface treatment applications. (4) Proper processing of steel slag and special quality-control procedures are extremely important in selecting steel slag for use in asphalt paving mixes. Of particular importance is the potential for expansion because of free lime or magnesia in the slag, which could result in pavement cracking if ignored. Steel slag use in paving mixes should be limited to replacement of either the fine or coarse aggregate fraction, but not both, because hot mix asphalt containing 100 percent steel slag is susceptible to high void space and bulking problems due to the angular shape of steel slag aggregate. Mixes with high void space (100 percent steel slag aggregate mixes) are susceptible to over-asphalting during production and subsequent flushing due to in-service traffic compaction. Some of the positive features of steel slag aggregates in hot mix asphalt include good frictional properties and stripping resistance, high stability, and resistance to rutting/plastic deformation. Use of unsuitable or improperly processed slag, however, can result in performance problems. Special quality-control procedures are needed during steel slag production (at the steel-making plant) and during aggregate processing to ensure that steelworks "rubbish" (furnace brick, wood, incompletely fused fragments, lime, rock, etc.) is not included as part of the steel slag aggregate. In addition to cleaning, aging, and quality-control requirements, crushing, screening and magnetic separation are required to produce a suitable coarse or fine aggregate product. Consistency of gradation, unit weight, and absorption are important for steel slag aggregates to be used in hot mix asphalt, and the aggregate processor must ensure that this is achieved. There is typically a large variation in the physical, chemical, and mineralogical properties of steel slags. This difference is dependent on the steel-making plant, steel-making process, specific furnace, steel slag processing, and storage strategies. For this reason, the use of steel slag aggregate must be considered on a specific steel-making furnace and processing basis, with recognition of the inherent variability of the slag production and the presence of potentially hydratable free lime and free magnesia. Some of the properties of steel slag that are of particular interest when steel slag is used in asphalt concrete include gradation, specific gravity, durability, moisture content, absorption, frictional properties, and thermal properties. Specific Gravity: Due to the relatively high specific gravity (3.2 to 3.6) of steel slag, steel slag aggregate can be expected to yield a higher density product compared with that of conventional mixes. Bulk relative densities are 15 to 25 percent greater than most conventional mixes. Durability: Steel slag aggregate is very hard and abrasion resistant. Steel slag aggregates display good durability with resistance to weathering and erosion. Moisture Content: The relatively rough surface texture (deep pores) of steel slag increases the susceptibility of the aggregate to differential drying and potential retention of moisture in the hot mix. Moisture retention coupled with the presence of hydratable oxides could result in volumetric instability. To minimize drying requirements and the potential for hydration reactions, steel slag aggregate moisture content should be limited to 5 percent prior to use in hot mix asphalt. The moisture content of the steel slag aggregate after drying should be no greater than 0.1 percent. Absorption: Steel slag has somewhat higher absorption than conventional aggregate. This can result in an increased asphalt cement demand. Asphalt cement extractability (in lab tests) can be more difficult than for conventional aggregate. Frictional Properties: Experience in several countries with steel slag aggregates in hot mix asphalt suggests that very satisfactory frictional resistance can be anticipated. Polished stone values (PSV, high values desirable) and aggregate abrasion values (AAV, low values desirable) support the general finding that steel slag aggregate exhibits superior frictional resistance for highway pavements. (10)The high frictional resistance, as well as the abrasion resistance of steel slag aggregate, is advantageous in applications where high wear resistance is required, such as industrial roads, intersections, and parking areas subjected to heavy traffic. Thermal Properties: Steel slag aggregates have been reported to retain heat considerably longer than conventional natural aggregates. The heat retention characteristics of steel slag aggregates can be advantageous for hot mix asphalt repair work during cold weather. Some of the mix properties that are of interest when steel slag is used in asphalt concrete mixes include stability, stripping resistance, and rutting resistance. Stability: Steel slag aggregate mixes combine very high stabilities (1.5 to 3 times higher than conventional mixes) with good flow properties. Stripping Resistance: Steel slag mixes typically exhibit excellent resistance to stripping of asphalt cement from the steel slag aggregate particles. Resistance to stripping is most probably enhanced because of the presence of free lime in the slag. Rutting Resistance: The high stability (1.5 to 3 times higher than conventional mixes) with good flow properties results in a mix that resists rutting after cooling, but is still compactable. Rutting resistance is advantageous for highways, industrial roads, and parking areas subjected to heavy axle loads. Asphalt mixes containing steel slag can be designed using standard laboratory procedures. Mixes combining steel slag aggregate and conventional aggregates are usually designed volumetrically because of the significant difference in aggregate bulk relative densities. Steel slag aggregate use is limited by many jurisdictions to either coarse or fine aggregate (but not both) to mitigate potential bulking problems (poor compactability and high void space). This problem can also be mitigated by blending the coarse or fine steel slag aggregate with conventional natural (more rounded) materials to facilitate the compactability of the hot mix. Petrographic examination should be undertaken of all steel slag aggregate to identify the presence of deleterious components. No lime or lime-oxide agglomerations should be detected. The potential for steel slag expansion should be tested in accordance with ASTM D4792 in a 7-day water immersion test. A maximum expansion limit of 1 percent is recommended. Steel slag aggregate hot mix asphalt immersion expansion testing on final Marshall hot mix asphalt plugs should be undertaken to ensure stable hot mix asphalt. No cracking or popouts and only slight staining in steel slag hot mix asphalt briquettes after 72 hours of immersion in 60° C water baths should be acceptable. Autoclave disruption testing at atmospheric pressure using accelerated 1-hour tests to give quick information on the slag volume expansion potential should be considered, and acceptable limits should be established based on field performance testing. These specifications were recommended as a supplement to minimum aging requirements for stockpiles of processed steel slag aggregates. Conventional AASHTO pavement structural design methods are appropriate for asphalt pavements incorporating steel slag in the mix. The same general methods and equipment used to handle conventional aggregates are applicable for steel slag aggregates. Stockpiles for the processed (crushed and screened) coarse and fine steel slag aggregates, however, should be maintained in a consistently wet condition before supply to the hot mix plants. The period of aging in wet stockpiles should be established by process-control testing to satisfy deleterious components criteria (autoclave soundness, ASTM D4792(12) expansion testing). The storage period should be a minimum of 3 and perhaps up to 18 months. Until such time as process-control testing (as outlined above) indicates that the steel slag aggregates are suitable for use in hot mix asphalt, it is recommended that additional aging be required. Steel slag aggregate moisture content and hot mix asphalt moisture content consistency are important to satisfactory mix production. It is recommended that the maximum moisture content of coarse and/or fine steel slag aggregates upon introduction to the hot mix plant not exceed 5 percent. The maximum moisture content of steel slag aggregate hot mix asphalt should not exceed 0.1 percent. The same methods and equipment used for conventional pavements are applicable to asphalt pavements containing steel slag. Several issues pertaining to the use and subsequent recycling of steel slag aggregates in hot mix asphalt still need to be resolved. Although the incidence of map cracking associated with the use of steel slag aggregates is widely acknowledged, there is a need to determine the extent to which this problem undermines the structural integrity of the pavement. Limited investigations suggest that structural performance is not adversely affected; however, more long-term monitoring data are required to verify influence of the cracking on pavement life expectancy. Since map cracking is recognized as a performance problem, but is not directly addressed by ASTM and AASHTO standard methods, there is a need to establish standard methods to assess the suitability of steel slag aggregates for hot mix asphalt use and for surface treatment. Also, long-term field performance data are required to assess the performance of surface treatments containing steel slag aggregates. Rossini-Lake, L., J. J. Jiang., and C. Curtis. Reclaimed Steel Slag Pavements for Use as Aggregates - Highway 10 Test Sections. Interim Report, Ministry of Transportation, Ontario, December 1995. Kandahl, P. S., and G. L. Hoffman. The Use of Steel Slag as Bituminous Concrete Fine Aggregate. Final Report, Research Project No. 79-26, Pennsylvania Department of Transportation, in Cooperation with U.S. Department of Transportation Federal Highway Administration, 1982. Norton, J. E., Use of Steel Furnace Slag in Bituminous Mixtures. Research Report No. 78 TB-23, Michigan Department of Transportation, 1979. Noureldin, A. S., and R. S. McDaniel. Evaluation of Steel Slag Asphalt Surface Mixtures. Transportation Research Board, Paper No.890673, Washington, DC, 1990. Blemker, D., Heckett MultiServ. (Note: MultiServ is an international firm involved in handling steel slag -- mainly for metals recovery.) Personal Communications with M. MacKay, John Emery Geotechnical Engineering Limited, August and September 1996. Farrand, B. and J. Emery. "Recent Improvements in the Quality of Steel Slag Aggregate." Paper Prepared for Presentation at 1995 Annual Meeting of the Transportation Research Board, Washington, D.C., January, 1995. American Society for Testing and Materials. Standard Specification D1139-95, "Aggregate for Single or Multiple Bituminous Surface Treatments," Annual Book of ASTM Standards, Volume 04.03, West Conshohocken, Pennsylvania, 1996. American Society for Testing and Materials. Standard Specification D5106-91, "Steel Slag Aggregates for Bituminous Paving Mixtures," Annual Book of ASTM Standards, Volume 04.03, West Conshohocken, Pennsylvania, 1994. American Society for Testing and Materials. Standard Specification D4792-95, "Potential Expansion of Aggregates from Hydration Reactions,"Annual Book of ASTM Standards, Volume 04.03, West Conshohocken, Pennsylvania, 1996. JEGEL. Steel Slag Aggregates Use in Hot-Mix Asphalt. Final Report. Prepared by John Emery Geotechnical Engineering Limited for the Steelmaking Slag Technical Committee, April, 1993. Senior, S. A., S. I. Szoke, and C. A. Roberts. "Ontario's Experience with Reclaimed Materials for Use as Aggregates," Proceedings, International Road Federation/ Transportation Association of Canada Conference, Volume 6, Calgary, Alberta, July 1994. Steel slag can be used as aggregate in granular base applications. It is considered by many specifying agencies to be a conventional aggregate and can normally exceed the aggregate requirements for granular aggregate base. The high bearing capacity of steel slag aggregates can be used advantageously on weak subgrades and in heavy traffic applications. Good interlock between steel slag aggregate particles provides good load transfer to weaker subgrades. Because of their similar particle shape and angle of internal friction, blast furnace slag aggregates have at times been blended with steel slag aggregates to improve yield, without substantial reduction in stability. Since volumetric instability of steel slag granular base (due to lime and dolime hydration reactions) has resulted in expansive reactions, steel slag aggregate granular base should not be utilized in confined applications, such as backfill behind structures, granular base, subbase confined by curb and gutter, and trenches. In addition, the formation of tufalike precipitates (white, powdery precipitates formed by the chemical reaction of atmospheric carbon dioxide and free lime (CaO) in the steel slag) has resulted in deposits that have clogged subdrains and drain outlets. (2,3) The clogging of drainage paths creates water retention and soft pavement conditions. Frost action on the retained water can result in severe pavement distress. Although weathering is useful to control the volumetric instability of steel slags, it does not appear to prevent the formation of tufa precipitates. Prior to use as a granular base material, ferrous components of the steel slag are magnetically separated. Steel slag must be crushed and screened to produce a suitable granular aggregate gradation using processing equipment similar to that for conventional aggregates. Gradation: Steel slag can readily be processed to satisfy the AASHTO M 147(8) gradation requirements for granular aggregates. Specific Gravity: Due to the relatively high specific gravity (3.2-3.6) of steel slag, steel slag aggregate can be expected to yield a higher density product compared with conventional mixes (2.5-2.7). Stability: Steel slag aggregates have high angle of internal friction (40° to 45° ) that contribute to high stability and California Bearing Ratio (CBR) values up to 300 percent. Durability: Steel slag aggregates display good durability with resistance to weathering and erosion. Corrosivity: The pH value of the steel slag aggregate generally ranges from approximately 8 to 10; however, leachate from steel slag can exceed a pH value of 11. This can be corrosive to galvanized or aluminum pipes placed in direct contact with the slag. Drainage Characteristics: Steel slag aggregates are free draining and are not susceptible to frost. Volumetric Instability: Steel slag has a potentially expansive nature. Volume changes of up to 10 percent or more can occur during the hydration of calcium and magnesium oxides. Granular base containing steel slag should be designed so that it is well drained (no standing water) and adequately separated from water courses to prevent immersion. Pavement joints should be sealed to minimize the ingress of surface water into the steel slag granular base. These provisions are recommended to minimize the potential for leaching of free lime or dolime that may be present in these aggregates, causing tufa deposits. 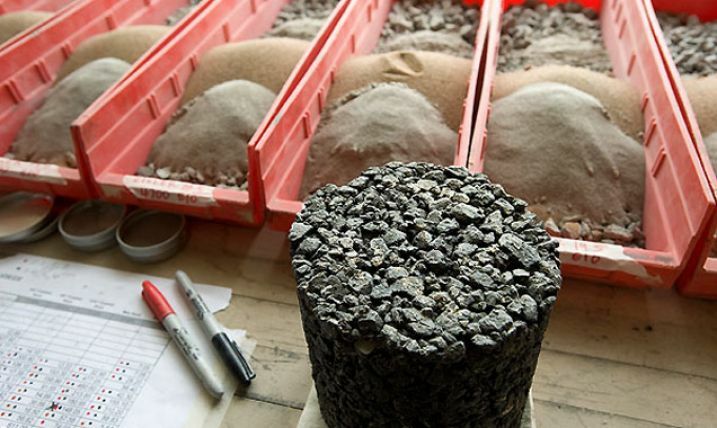 Conventional AASHTO pavement structural design procedures can be employed for granular base containing steel slag aggregates. The same general methods and equipment used to handle conventional aggregates are applicable for steel slag. Stockpiles of processed steel slag aggregate, however, should be maintained in a wet condition prior to delivery to the job site. The period of aging in wet stockpiles should be established by process-control testing to satisfy deleterious components (petrographic examination and ASTM D4792 expansion testing) criteria. Until process-control testing indicates that the steel slag aggregates are suitable for use in granular base, it is recommended that additional aging and reprocessing be required. The same methods and equipment used to place and compact conventional aggregate can be used to place and compact steel slag. Care is required to avoid placing the material below grade and in locations where it is likely to be immersed in water (to avoid volumetric instability and tufa formation). A good groundwater drainage system is recommended when steel slag aggregate is used to allow free drainage and to prevent ponding within or against the steel slag. There is a need to establish standard methods to assess the suitability of steel slag aggregate for granular base applications and to develop guidelines for the use of steel slag aggregates in this application. Improved testing methods are needed to establish the potential for tufa precipitate formation. Collins, R. J., and S. K. Ciesielski. Recycling and Use of Waste Materials and By-Products in Highway Construction. National Cooperative Highway Research Program Synthesis of Highway Practice 199, Transportation Research Board, Washington, DC, 1994. Feldman, R. M. Tufa Precipitation and Its Effect on Drainage of Highways. Report, Kent State University, July 1981. Gupta, J. D., W. A. Kneller, R. Tamirisa, and E. Skrzypezak-Jankun. Characterization of Base and Subbase Iron and Steel Aggregates Causing Deposition of Calcareous Tufa in Drains, Not Dated. PIARC. Marginal Materials. State of the Art Report, Permanent International Association of Road Congresses, Paris, 1989. Kneller, W. A., J. Gupta, M. L. Borkowski, and D. Dollimore. "Determination of Original Free Lime Content of Weathered Iron and Steel Slags by Thermogravimetric Analysis," Transportation Research Record 1434, National Research Council, Washington, DC, 1994. Narita, K., T. Onoye, and Z. Takata. On the Weathering Mechanisms of LD Converted Slag (in Japanese). Koba Steel Ltd., Japan, 1978. Farrand, B. and J. Emery. "Recent Improvements in the Quality of Steel Slag Aggregate," Paper Prepared for Presentation at 1995 Annual Meeting of the Transportation Research Board, Washington, DC, January, 1995. American Society for Testing and Materials. Standard Specification D2940-92, "Graded Aggregate Material for Bases and Subbases for Highways or Airports," Annual Book of ASTM Standards, Volume 04.03, West Conshohocken, Pennsylvania, 1996.